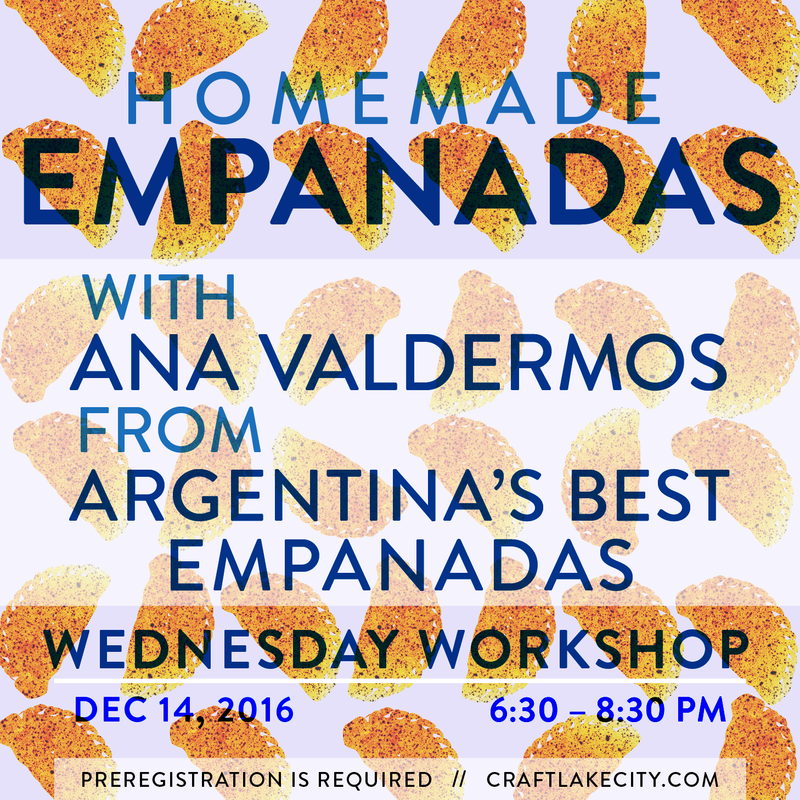 Salt Lake City, Nov. 18— Craft Lake City and Argentina’s Best Empanadaspresent the December Empanadas Workshop with Ana Valdemoros. The workshop will be held on Wednesday, Dec. 14, at Argentina’s Best Empanadas from 6:30 to 8:30 p.m. Feeling nostalgic one Saturday morning at the Downtown Farmers Market, Ana Valdemoros decided to start selling freshly baked empanadas to Salt Lake City. The following summer, Valdemoros opened a small booth at the Farmers Market to sell traditional Argentine empanadas with fresh ingredients and fillings that appeal to the local palate. In 2016, Valdemoros opened Argentina’s Best Empanadas’ storefront in downtown Salt Lake City, where she sells five kinds of empanadas that strive to meet the freshness and quality of the highest caliber. Workshop participants will learn the basics of filling and folding empanadas and will go home with half a dozen of each two types of empanadas: sweet pumpkin cheesecake and savory Beehive Cheese and green onion. There is a $35 material fee for this workshop, which includes empanada education and supplies to make one dozen empanadas. Pre-registration is required. Register here. Visit craftlakecity.com/workshops or our Facebook for more information. Workshop Attendance Policy: Participants are required to arrive and check in with the Craft Lake City Workshop Coordinator five minutes before the workshop begins, or their spot will be given to a participant on the waitlist. If you wish to be added to the waitlist, please arrive 15 minutes before the workshop begins and check in with our Workshop Coordinator. You will be added to the waitlist to take the place of an absent participant’s spot, first come, first served. Waitlisters are not guaranteed admittance. About Craft Lake City: Craft Lake City is a 501-c3 charitable organization. Our mission is to educate, promote and inspire local artisans while elevating the creative culture of the Utah arts community through science, technology and art. In an effort to keep the community active, educated and aware of local DIY culture, Craft Lake City hosts monthly workshops, gallery shows, fundraisers and an annual festival to promote regional spending with independent artisans and businesses. About Argentinas Best Empanadas: Started by Ana Valdemoros at the Downtown Farmers Market in 2006, Argentinas Best Empanadas is committed to providing handmade empanadas made from local and seasonal ingredients, while encapsulating traditional Argentinian cooking methods.